Even the moon has two sides - the bright and the dark, so does every human. Here I talk about my two aspects - the professional and the personal. I understand that it is a big decision for you to trust your eyes to anyone’s hands, therefore, you certainly would like to know more about who those hands belong to. Just like the moon I don’t have my own light – my life is an effort to reflect what I have learnt from my great teachers, many great books, experience of my able colleagues and the knowledge imparted by my own mistakes. My life is also the expression of my gratitude to mother nature that blessed me with skills, ability and a compassionate heart to help people. Born in a humble family, my schooling took place in New Delhi in two schools viz. Greenfields Public School & St. Xavier’s School. I pursued English literature for a while when I was waiting to join Maulana Azad Medical College, New Delhi – one of the premier medical schools in India. I completed my MBBS in 1987 and finished my internship in 1988. Working as Junior Resident in the Departments of Surgery, Internal Medicine and Pediatric Surgery, I discovered that I had special ability in fine surgical work. Advised by one of my professors, I joined DO (Ophthalmology) at Guru Nanak Eye Center to explore eye surgery, and observing my own surgical results I was convinced that I found my destiny. After completing DO in 1992, I went on ahead to pursue MS (Ophthalmology) at Lady Hardinge Medical College, New Delhi. Successfully breaking two exams at the same time was a feat of sorts. My masters was a period of a lot of learning, honing my surgical skill, conducting research on effects of contact lenses on the eye and also teaching the undergraduates and my junior colleagues, and strangely sometimes even my seniors. The hard work was bore fruit and I was awarded Delhi University Gold Medal by the Former President of India Shri K R Narayanan, for being the best candidate in MS (Ophthalmology) for the year 1995. I continued working in the same department as Senior Resident for another 3 years independently handling all the clinical & surgical work. In 1998 I had a great fortune of being appointed as Assistant Professor of Ophthalmology at Manipal College of Medical Sciences, Nepal and associated Himalaya Eye Hospital, a project of FECH of The Netherlands. It was an enriching experience professionally & spiritually. I learnt some new surgical techniques in cataract surgery, glaucoma surgery, cornea transplant, squint and oculoplasty surgery. I also perfected and modified some old techniques. Teaching undergraduates became a passion. Year 2000 I joined Lions Hospital & Research Center, New Delhi where had the opportunity to serve community to the best of my ability. I revolutionized the concept of community service by providing high quality eye surgery at low cost to the masses. I was amongst the first to popularize the technique of SICS for mass application in New Delhi, and I was probably the first to introduce a modified Topical Anesthesia to perform SICS. The large scale surgical experience helped me refine the surgeries of Phacoemulsification, MICS (Phakonit), Lasik, Supra-Whitnall’s Resection of LPS for Ptosis, etc. Encouraged by my surgical results and the need for delivering highly specialized care to the patients, I directed my focus & efforts to Cataract & Refractive Surgery. In 2001 I also joined Max Healthcare and divided my time between hospitals – a time of catering to two diverse segments of society and learning the art of meeting the needs of both. In 2004 Bausch & Lomb India introduced me to an association with a business house to setup and run a state of the art eye hospital – Perfect Vision Eye Hospital at Faridabad. Introduction of high quality eye surgery and high service made this project hugely successful. As the medical director of the hospital I guided a group practice approach and a no-compromise policy on quality care. At Max Healthcare I continued to deliver world class healthcare in ophthalmology – a philosophy embodied by Max, and also convinced the company to setup a world class eye care facility – Max Eye Care. As part of my commitment to this venture, I withdrew my clinical practice from everywhere to join Max Healthcare full time as Head of Department, Max Healthcare at Max Eye Care, Panchsheel Park, Saket & Gurgaon. My endeavors and the support of the management of MaxHealthcare,helped put togethera very proficient and able teamof eye surgeons, and a facility which the best equipped eye department in any multi-specialty private hospital in New Delhi and NCR. The department provides a very comprehensive eye care encompassing all the aspects of ophthalmology to the patients from India and abroad. I am a member of important national and international professional organizations for ophthalmology including Delhi Ophthalmological Society, All India Ophthalmological Society, American Society of Cataract & Refractive Surgery, etc. 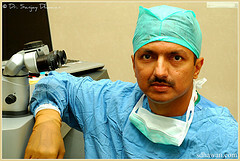 I am also an expert & advisor in ophthalmology to many media houses & publications. Cataract Surgery Phacoemulsification, MICS, SICS, Pediatric Cataract, Traumatic Cataract, etc. performed under Topical Anesthesia without the need for injections, stitches or bandage in 99 % of cases. Excellent skills in Lens implant surgery with use of unifocal, multifocal and toric foldable lenses. Experience of large volumes of surgery and extremely low rate of complications – at par with the best institution or individual in the world. Refractive Surgery Lasik & Custom Lasik Pursuit of stringent selection criteria and high quality surgical protocols & meticulous technique has lead to achieving high degree of accuracy in results and an extremely low rate of complications – at par with the best the world over. Respectable experience and expertise in dealing with other areas of ophthalmology. Approaching the patients & profession with high standards of ethics and quality care, and making patients partners in managing their eye diseases by providing accurate & unbiased information about their diseases & its treatment. Working as a tool in the hands of mother nature and not as egoistic demigod and pursuing science without loosing sight of compassion. I will leave this job to the person who knows it the best – my wife! Nidhi is an ENT surgeon working as Senior Consultant at Shroff Hospital, Daryaganj, New Delhi. We met in 1987 at Maulana Azad Medical College, married in 1993, have two children and have been blessed with a happy journey so far. “What would I call him? What can I call him? I (and he, too!) am not given to endearments of Darling and Honey! That is the refuge of those who may be comfortable making their affections and feelings an object for public consumption. Not him. And definitely not me. He is foremost an Eye Surgeon. I still remember the time he had to have a forearm surgery on his right arm... he was worried sick what could happen if they injured a vital nerve?! (Doctors form bad patients). Sometimes I have to drag him out of that role and remind him to be a father and a husband. He almost defines his existence by his professional role and lives and breathes the dedication and care he lives each day. With a hand that is rock steady and a confidence that is as unshakable he operated on his own mother's eyes, my father's eyes and now, on the eye of my brother's mother-in-law who had a critical clinical situation. The anaesthesiologist standing by for my mother-in-law (she is prone to cardiac arrhythmias) remarked, " were we able to monitor your husband's pulse, I am sure we would be able to set the watch by it. His hand did not waver even for a microsecond during the surgery. And I had to remind myself that this surgeon is operating on his own mother!" He has been a builder, a dedicated worker and a leader who has always led from the front. He has been open to teaching his skills and techniques to all those who may want to learn. He has done donkey's work and carried mule's loads for the departments he has built in the past. 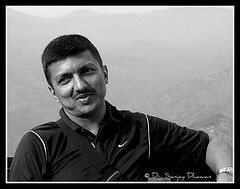 Meet Sanjay, the lone pioneer. Always the people's man... he has lost sleep over the doctor who seems to have a personal or a professional problem; as well as the patient who needs his skill but cannot afford it. He has just picked up a street urchin simply because he saw that the girl was blind, taken her and her father to a state-of-the art facility, examined the child and not only provided medical care but also picked up his own daughter's clothes and given them to a girl who will not be able to see what she is wearing. Because he could not bear the idea of a girl child who is unable to see wear torn clothes that expose her dignity to the harsh eyes of a community that refuses to see. He has been an admired teacher and a loved tutor by students at all levels. Concepts that flummox seasoned teachers flow very easily from this unassuming and passionate man! There are many who still look for and study from the notes that he once released to make difficult concepts understandable. He still goes out of his way to impart his hard earned skills to those who are willing to learn. Whether it is the revolutionary concept of eye drop, no injection anaesthesia or the minimally invasive techniques of blindness alleviating surgery, he is willing to let his skill live on long after he is gone. The man who can come home looking as if he needs to rest... eyes nearly closing... and his face lights up at the sight of his daughter- hugging her and joking with her to lighten the load on her tender shoulders. And the son who he holds in a bear hug and revels in... Saniya has started to work out things on her own. She watches keenly. She wants to try hooking the laptop to the Sony Bravia simply because she has seen her Chacha do it. And Sanjay will smile, knowing she can. Moksh asks questions endlessly... and 'eats our heads'. But Sanjay smiles indulgently (and rather proudly) and says, " I love him to ask! I will serve my head on the platter and invite to be eaten. I love to answer whatever questions he may ask. And explore together if I cannot answer!" And then, at the end of a fruitfully lived day, this man suddenly realises that his laptop is not working optimally or that his CD player is beginning to act up or that the Dishwasher is being a little obstinate or that the Refrigerator is being too noisy for his comfort. He will set up any system to his satisfaction and open up the CD player (Its head needs SHAMPOOING!). Or a little bit of tinkering and " Let us see if it doing OK now?" with the dishwasher. And the Refrigerator? Oh! That simply needs to be moved a little here or there. Viola! No more noise. Ah! Do not miss the little wooden piece that dampens the vibrations of our ventilator in the drawing room... You see, this glass used to add a little unwanted noise to his musical experience! And not to forget the man who carries at least twenty-five kilos on his back comprising three to five cameras of various specifications on any vacation! We were held up at the Srinagar airport for over an hour because no one could believe that a single man could use all the equipment in that bag. Each piece was checked and cross-checked. We have holiday photographs and family shots that we all love to watch. His photographs have even made it to heritage calendars. Photography is a driving passion with this man. It would be difficult for an onlooker to imagine that the man loaded with the cameras is really an eye surgeon. And then there is a rather private part of my heart and life that this man inhabits. He loves me and he irritates me. He cares for me and recklessly tramples over my feelings, too. He is worried sick if I am away without information and yet thinks nothing of doing the disappearing act himself. He smiles and still makes my heart do flip flop and makes my knees go weak. He speaks without having to say a word. And refuses to speak when I really wish he would say something! Sometimes he really obliges and says something," Something!" And he says it with the same naughty smile that took my heart away more than twenty years ago. Thank god for that day he called me back from the gate of the college to rag me!